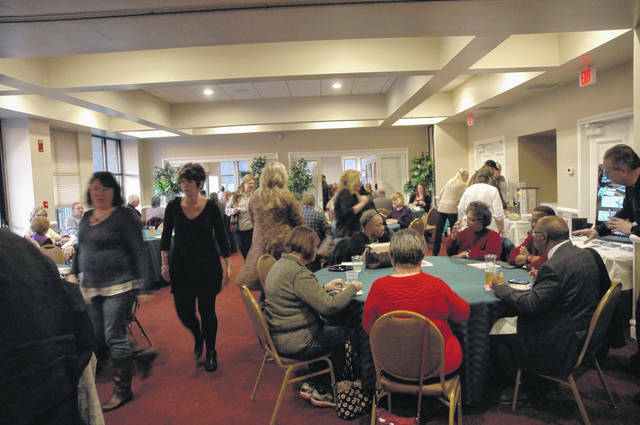 Guests packed the clubhouse at Meadowbrook at Clayton to sample food offered by several local restuarants and caterers Thursday night. 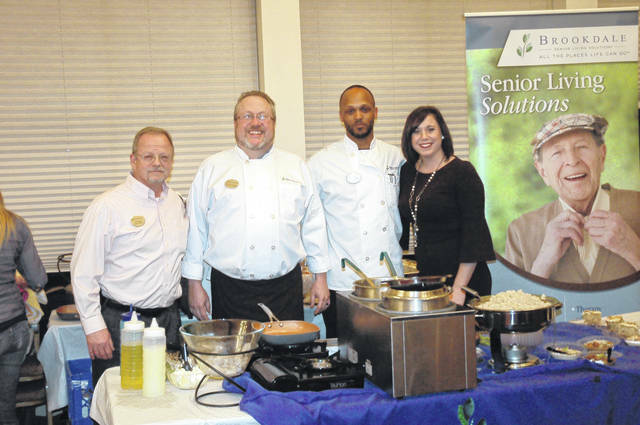 Pictured from left to right, Brookdale Centennial Park Executive Director Mark Spirk, Chef Robert Newman of Brookdale Troy, Chef John Campbell of Brookdale Englewood, and Keshia Mong, sales manager Brookdale Centennial Park. 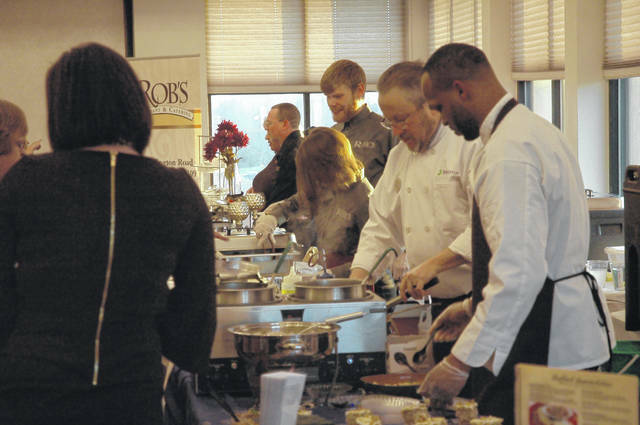 CLAYTON — A huge crowd packed the clubhouse Thursday at Meadowbrook at Clayton for the ‘Taste of Northmont’ event sponsored by The Northmont Area Chamber of Commerce. The event ran from 5 to 8 p.m. but a large crowd lingered past 8 p.m. to experience a “taste” from several local restaurants and caterers. Guests voted on the “Best of” and a cash bar was kept busy. Standard drinks like wine, Miller Lite and ‘Trotwood Lager’ provided by Warped Wing Brewery were popular purchases at the bar. People arrived early with the clubhouse filled with guests at 5 p.m. More than 300 tickets were sold and a few more the night of the event at the door. As guests entered, the aroma wafting through the air was intoxicating and many hurried to sample all of the food fare offered. Some of the vendors included Bob Evans Catering, Boston Stoker, Rob’s Restaurant, JD’s Old Fashioned Frozen Custard, La Fiesta, Brookdale Senior Living Solutions chefs, Heritage Event and Catering, plus many more. Local dignitaries attending included Linda Bryan of the Englewood Arts & Festival Commission, Northmont School Board members and employees, Bill Kindred of Kindred Funeral Home, Mark Spirk of Brookdale Centennial Park Senior Living Solutions, Ted Gudorf of Gudorf Law Group, former Marine Bill DeFries – CEO of Copp Integrated (security) Systems, members of Clayton city council and staff, State Representative Mike Henne (R) District 40, just to name a few. The event gave everyone a chance to visit, renew friendships and enjoy a special evening of camaraderie and great food and drinks. They won a free one-year membership to the chamber. Gold – Gudorf Law Group, Praise FM 97.9 WGJM & WGNZ. Silver – Code Credit Union, BrookHaven Retirement Community, Heritage Event, Pristine Senior Living & Post-Acute Care Englewood, and the Englewood Independent. Bronze – Meadowbook at Clayton, The Digital Cowboy, Western Ohio Graphics. In addition restaurants and caterers donated 10 door prizes which guest were entered into for free.